The alien school children from the planet Zigmo travel to distant planets on a field trip. The goal is to select a bus size so that all buses are full and no aliens are left behind. This is a nice illustration of division with remainders. Model division of whole numbers. Solve whole number division problems with the aid of a model. Understand the concept of a remainder. 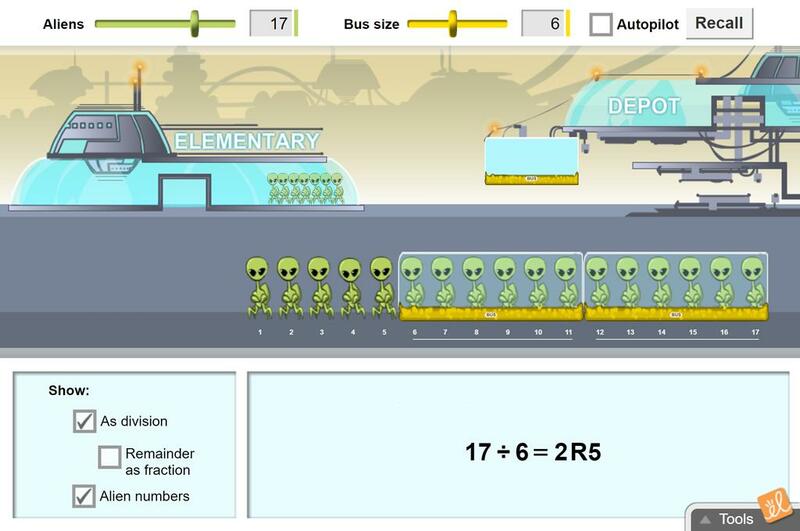 Great site for learning division with remainder, lots of fun. A really cute gizmo with fun features that help the students get the concept of division and remainders while building vocabulary. Great way to introduce or review division with remainders. This is great for students who are visual learners or are struggling with division. I continue to refer back to this Gizmo, as my classes really connected with what to do with the remaining numbers or "aliens". Fun! Awesome way to move kids from drawing groups into algorithm. It also helps them to know how to interpret a remainder by adding one to the quotient - a tricky concept for a lot of kids. My older kids still LOVED this gizmo! It really helps them to visualize what they're doing when they divide.